The Northeast India has become almost synonymous with ethnic politics and its violent manifestations. Over the years, it has baffled the social scientists and other observers. The region has been experiencing mass mobilisations and extreme polarisations in ethnic lines. The ethnic homeland is the buzzword for communities small or big. Mobilisations around ethnic homeland often lead to violence and armed conflicts. The proliferation of small arms and porous border has complicated the ethnic issues further. In order to address and study the prevailing situation of political ferment and violence caused by ethnic assertions, insurgency and intense militarisation in Northeast India, Institute has been conducting some interesting researches over the years. The study Collective Violence in Western Assam: Causes, Accounts and the Consequences currently underway at the Institute is trying to understand the violence that spiralled into a major riot from July 21, 2012 in Western Assam. The violence has raised some of the very complex and delicate issues in the state politics namely practicing models of autonomy in ethnic lines, migration during the colonial and post-colonial period, the resultant demographic transformation and the series of ethnic riots between different communities of the state in the last few decades. The study envisages looking broadly at the historical context of the Bodo Movement, the migration that affected the land relation, militarisation of the society as well as the immediate reasons of the spread of violence in current political scenario. "The Institute has entered a major collaboration with Peace Research Institute, Oslo (PRIO) and conceived the project Imagined Sovereignties Frontiers of Statehood and Globalization. This is a major global collaboration on the part of the Institute. The project investigates how sovereignty is perceived and debated by diverse stakeholders in on-going sovereignty contestations. In order to explore the multiple ways in which sovereign futures are currently imagined, the study will conduct in-depth studies of three cases of protracted, on-going conflict, exploring how sovereignty is imagined and debated by key actors and contestants, and their constituencies. The three cases under study are: statehood contestations on the divided island of Cyprus, the Basque movement for self-determination, and Northeast Indian separatist and autonomy movements. Each case exemplifies a particular issue in current debates on the meaning of sovereignty: statehood, nationhood and indigeneity. This project seeks to highlight the gaps between abstractions of sovereignty in theory buidling and the meanings of sovereignty that are culturally shaped and drawn from everyday local experiences. The study is funded by the Research Council of Norway. Funded by ICSSR, this project was transferred to the Institute in August, 2014 from Gauhati University. The project plans to study the effects of displacement on women in conflict-ridden areas of BTAD. It envisages to look at the psychological conditions of the displaced women after conflict, to understand the vulnerabilities in the social lives of women victims, to gauge the economic impact of conflict on the lives of displaced women, to help incorporation of women in the peace process, to comprehend the effect of repeated violence on the everyday life of women and to present the narratives that emerge from the violence. It is envisioned that the finding of the study would be helpful for policy making and can be used fruitfully, for active intervention in times of crisis. The study “Ethnic Identity, Regionalism and Coalition Politics in India’s North East” is an exercise to understand the complex trajectory of state formation in the Northeast India. It attempts at critically comprehend the tensions inherent in the centralizing and decentralizing tendencies of the state imposed upon by a neo-liberal regime of good governance and its paranoia of internal security. Northeast India because of its critical politico spatial location provides a ground to both problematize and theorize the changing nature of Indian politics. It also attempts to capture the political changes both at procedural and substantive levels, and address the issue of identity politics. The study would try to understand as to where do the discourse of democracy and development figure in the political exigencies of the region. It would also try to comprehend a plethora of issues like the dynamics of how the hegemony of the centralist political parties, especially Congress got contested by the identity movements of the region, to understand how the regional political parties’ attempt to address the identity based as well development issues after capturing power in their respective states and to understand as to why coalition politics has turned into a reality for the region despite strong undercurrent of regionalism. Most importantly, the study envisages to understand as to why regional political parties are regarded as essential to the psyche of existence of peripheral democracies. Role of Women as Peace Builders The study revealed the importance of women in sustainable peace. 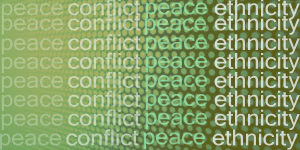 It shows that peace does not merely imply an absence of violence rather creation of an environment that facilitates constructive, peace building communitarian initiatives. Such an environment is essentially premised on changing structures of local governance with the maximum participation of women and a system that addresses diverse socio-structural inequalities. Gandhian Means of Non-Violence for Dispute Settlement This study critically looks at the Gandhian method of non-violence as a means of dispute settlement through the workings of an organisation known as TAGS, Kumarikata. It has discussed the issue based performance of the organisation in specific areas of intervention. Children Affected By Violence in Assam The study envisages to understand the situation of children exposed to armed conflicts and make recommendations programme interventions. The study came up with some startling facts like as many as 47.6 percent of the total households reported having children who suffer from depression, in as many as 22.7 percent of the families the children had to leave school after the death of the victim etc.